None of these symphonies has ever been performed in public. Once you’ve heard this music you will wonder why. All three works are definitely worth hearing. By making use of his digital orchestra, David Stanhope has breathed life into these neglected works, making them available to be heard for the first time. It seemed only fair to try a ‘blind tasting’. I sat my houseguest down, saying nothing other than I was interested in how this music struck her, and played the opening of the C minor Symphony of George Marshall-Hall. My guest is not a musician, though attends concerts and opera regularly, and might, I think, have thought it was some bizarre flight of my own fancy. So, as Marshall-Hall surged out of the Soundbox, I identified it as the work of this largely forgotten but colourful and fascinating figure in early 20th century Australian music. My guest kept listening, clearly enjoying it, but still baffled as to why I had asked her for her views. I, on the other hand, had known what to expect, and while I neither came to jeer, nor stayed to pray, I was really taken with what David Stanhope and his orchestra have achieved here. I for one always die a little bit when I hand over a score and am asked if I can provide a MIDI as well. ‘Yes’, I sigh, ‘if you want to hear it played by Daleks. But the sound is awful, the rhythm metronomic, there’s no chiaroscuro, and it doesn’t recognise things like string harmonics. It bears no relation to what’s in my head!’ Stanhope’s achievement here couldn’t be more different. His orchestra, of course, is not 90 people clustered around music stands in a studio, but rather a huge collection of sampled instrumental sounds (from the Vienna Symphonic Library and East West Quantum Leap) that he has selected, blended and manipulated to give a very close facsimile of the real thing. In fact, my houseguest couldn’t tell. As well as this huge range of even single sounds (any given instrument playing any given note in several ways) at Stanhope’s disposal, he has the ability to craft phrases with the flexibility that he would bring to a rehearsal with a human orchestra, and this gives these performances an extraordinary warmth. Occasionally, one is aware that it is too perfect, lacking, say, the many miniature random sounds that give the attack by a string section its particular grit, or the sense of danger that a real trumpet would induce in the fanfare that opens David Morgan’s 13th Symphony. To me, at least it is often the winds that give the game away ever so slightly – again in Morgan there is a passage in the finale (around 3:19) where the wind chording is a little disappointing yet is swept away by a glorious string texture. Inevitably, too, there are one or two moments where the editing seams show. 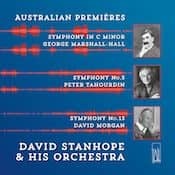 ‘But’, as Stanhope rightly points out in his liner notes, ‘spotting flaws (which may be the absence of flaws) is not the point.’ Rather, he has done the composers and us listeners a terrific service, which is to be able to hear works, in a form that closely matches the composer’s imagined results, which sadly have little prospect of being programmed. We shall pass over the question of whether excluding unfamiliar works from programming actually helps an orchestra’s bottom line. Suffice it to say, though, that a work like the Marshall-Hall Symphony would hardly scare the horses. Or even a Great Performers series audience. Dating from 1892 – the year Marshall-Hall became the first Ormond Professor at the new Melbourne Conservatorium – the Symphony is a perfectly honourable addition to the Romantic repertory. Spotting influences is not the point either, but suffice it to say that the piece is by turns Mendelssohnian, Brucknerian or Wagnerian, its three movements solidly built on the classical symphonic design revived recently by Brahms. A century on, Peter Tahourdin, another symphonist associated with the Melbourne Con, produced, but never lived to hear, his Fifth Symphony. I have written about Tahourdin here before, noting the essentially humanist nature of his enterprise and the importance he placed on the craft of composition. Stanhope’s rendition serves the music better, I think, than recordings of Tahourdin’s orchestral music have in the past. There is considerable beauty in Tahourdin’s orchestration, which is captured well here. His music also features rigorous and often highly angular counterpoint – the sort of writing, for strings in particular, that requires diligent rehearsal for spans of time not often available to orchestras today. For Stanhope’s virtual musicians this of course is a walk in the park, and this gives Tahourdin’s musical argument inelegant strength. David Morgan’s 13th Symphony is in a classical four-movement shape, and derives its character from a number of musical and literary antecedents to which he gives loving attention. His opening movement, based on fanfares for a 1950 production of King Lear and a more recent response to a Greek-inspired work of Kerry Greenwood, displays an idiom steeped in traditional tonal harmony. Morgan frequently uses block scoring, and as I have noted, it seems that some sounds work better than others in this rendition, so it occasionally recalls an organ transcription. The English pastoral slow movement is attractively coloured and contains a hint of real violence at its close. The ‘scherzo’ is based on the bounding rhythms of Pérotin’s organa from the 12th century; given instrumental form, the music begins to sound rather more like Grainger riffing on a folksong, energetic and colourful but not a bit holy. The brooding start to the finale, based on an original ground, and the introduction of fourths- based harmony suggest the world of Bartók, and the punctuating tubular bell flourishes work very well, though the movement could be a little longer, for my money, to really anchor the piece. Stanhope insists he’s not aiming to replace human orchestras, though once Skynet has become self-aware who knows what will happen. For now though, I welcome the opportunity to hear Stanhope’s versions, put together with such great diligence and musical intelligence, of music that deserves to be better known.